It’s a startling number. Every day, 28 people in the United States die in motor vehicle crashes that involve an alcohol-impaired driver, according to the Centers for Disease and Prevention. This is amounts to one death every 51 minutes. Unfortunately, the numbers aren’t any better for drug-related crashes either. In a recent article by The Denver Post, statistics show that drivers killed in crashes are now more likely to be on drugs—particularly opioids or amphetamines—than under the influence of alcohol. At Tiftickjian Law Firm, P.C., we did some digging to find out whether Colorado highways were safer now compared to last year. Sadly, the preliminary numbers are a bit troubling. Based on information provided by Colorado State Patrol, fatal alcohol and drug-caused crashes are up by 28 percent over the same period last year. Alcohol and drugs have been to blame for at least 41 deadly crashes through June of 2017, compared to 32 over the same period in 2016. Despite the uptick in deadly accidents caused by impaired driving, there is some good news. So far this year, injuries caused by alcohol and drug-related crashes have decreased by nearly eight percent. According to CSP, impaired driving stemming from alcohol and drugs have resulted in 214 crashes so far this year, compared to 232 for the same period last year. Property damaged caused by impaired driving also decreased by seven percent. Several European studies have found that marijuana use only slightly increases the risk of a crash while opioids, amphetamines and mixing alcohol with drugs greatly increases the risk of an accident. In Colorado, the legal limit for impairment by marijuana is 5 nanograms of THC in the blood. Based on recent stats, Coloradans appear to be doing a better job at following the law and avoiding stoned driving all together. According to Colorado State Police, marijuana citations are down this year compared to 2016. So far this year, police have issued 329 marijuana citations to drivers versus 416 issued last year. That’s nearly a 21 percent decrease. There are a few possible reasons for this decline. We hope that it’s due to the fact that Coloradans are getting the message about the dangers of “driving high behind the wheel.” We’ve also seen an uptick in the number of people taking ride-hailing services like Uber and Lyft. However, we should also realize that this decrease in citations may be a result of fewer police officers on the road, or those officers making fewer stops. 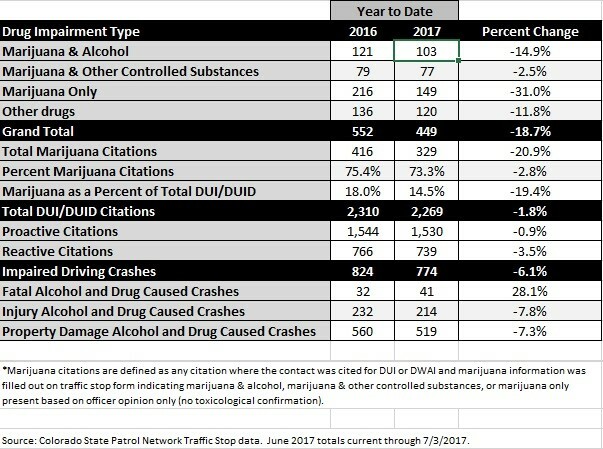 The fact that alcohol and drug-caused fatal crashes are up by 28% yet marijuana citations are down seems to support this. We’ll need more data before we’re able to determine the true effect of each. Here are additional statistics on impaired driving in Colorado involving alcohol or drug-related causes, provided by the Colorado State Patrol. When it comes to impaired driving, Colorado drivers appear to be more responsible on the roadways compared to drivers in other states. According to CarInsuranceComparison.com, Northern states in the Midwest and West are the most dangerous for drunken driving. Wyoming ranked first in fatalities and in driving-under-the-influence arrests in 2015. North Dakota, South Dakota, Montana, South Carolina, Mississippi, New Mexico, Kentucky, Maine and Arkansas round out the ‘Top 10’ list for the states with the worst DUI problems. Colorado was near the middle, at #21. When it comes to comparing drug-related crashes among states, the numbers aren’t readily available online. However, safety experts will agree drug-impaired driving is major problem for all 50 states. In fact, a recent study on highway fatalities found that 43% of motorists nationwide who died in a car accident had drugs in their system. This number surpassed the 37% of motorists who died who tested positive for alcohol in the same year. However, we need to keep in mind that laws, interpretations, and testing practices vary among states, and drugs can stay in drivers’ systems far longer than alcohol. A conviction stemming from alcohol or drug-related impaired driving can result in very serious consequences in Colorado. If you have been charged for driving under the influence of alcohol or driving while impaired due to prescription medication or illegal drugs, it is extremely important to work with an experienced Colorado criminal defense attorney. The criminal defense team at Tiftickjian Law Firm has worked with numerous clients defending against these and similar charges. If you are facing alcohol or drug-related charges, contact the Colorado criminal defense attorneys at Tiftickjian Law Firm to schedule a consultation where you can find out more about the charges you are facing as well as a potential defense that could be available for your circumstances.